This is the time of year when I tend to get a little lazy with my meals. 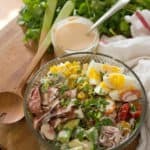 It’s my usual summertime routine – slap a hunk of meat and some fresh veggies onto the grill, throw together a quick salad from our little garden patch, and call it dinner. Maybe a handful of cherries for dinner, or a scoop of ice cream if I’m feeling particularly indulgent. Perhaps that’s why I’ve become such a big fan of chermoula lately. 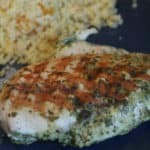 The Moroccan seasoning is normally paired with lamb or seafood, but it’s just lovely with chicken – especially the thighs, which are more flavourful and juicier than the breast, and conveniently cheaper too. 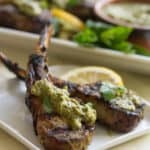 Chermoula is grassy and green and fresh, much like it South American kissing cousin, chimichurri, but it layers in an undercurrent of earthy North African spices that mingles beautifully with the smokiness from the grill. 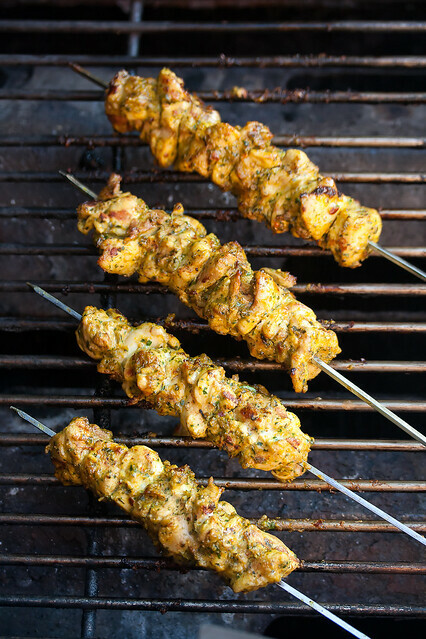 Sometimes I just throw the marinated thighs onto the grill as they are, but skewers just feel a little fancier somehow, especially if you add a dipping sauce made from Greek yogurt with a spoonful of reserved chermoula stirred in. 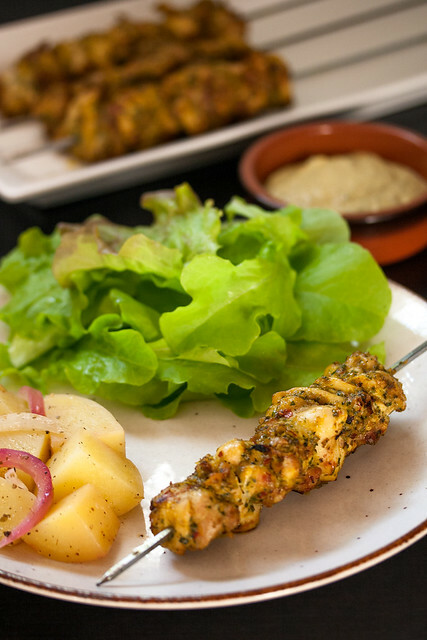 It does for these skewers what a raita does for tandoori, by providing a refreshing creaminess as a contrast to the warm spice of the marinade. 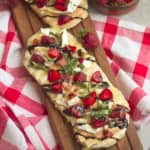 And yes, I do serve these with fresh veggies that have been tossed on the grill, and perhaps a fresh salad thrown together from the garden patch. Did you really expect anything else? 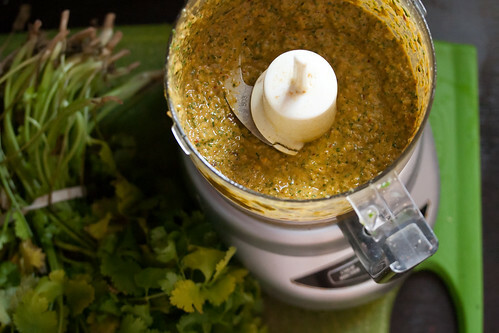 Chermoula is a Moroccan sauce made from cilantro, parsley and various spices that's normally paired with lamb or fish. Here it does double-duty as a flavourful marinade for bite-sized pieces of chicken thigh, and in a refreshing yogurt-based dipping sauce. In the bowl of a food processor, combine the red onion, parsley, cilantro and garlic. Process until everything is finely chopped, then slowly drizzle in the oil until the mixture comes together into a thick paste. Add the lemon juice, paprika, cumin, coriander, pepper flakes, turmeric, salt and saffron Pulse 2-3 times to combine. 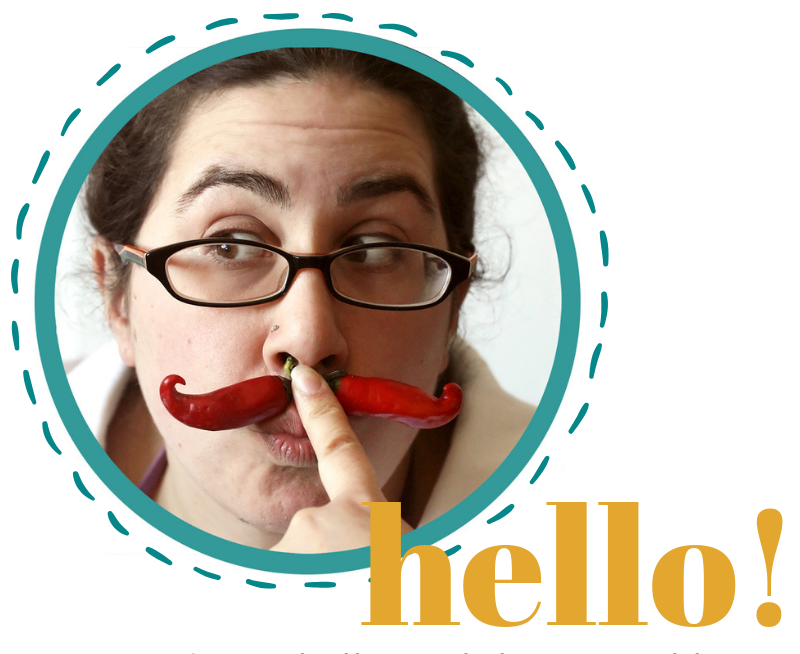 Scoop out ¼ cup of the chermoula, and set aside for later. Cut the chicken thighs into bite-sized pieces. Transfer to a zip-top plastic bag, and scrape in the remaining chermoula. Toss to coat the chicken evenly with the marinade, then transfer to the refrigerator to marinate for at least one hour (or up to overnight). Preheat a lightly-oiled grill to medium-high. 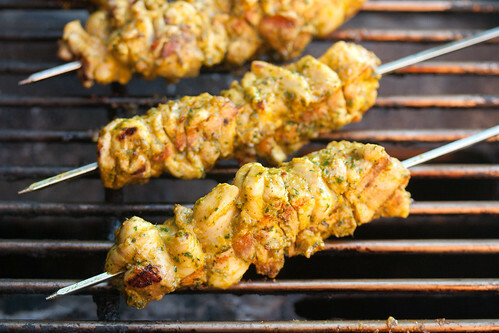 While you wait for the grill to heat up, thread the marinated chicken pieces onto skewers. Arrange the skewers on the hot grill and cook, turning occasionally, for 10-15 minutes or until the chicken is cooked through inside and well-browned on the outside. While the chicken is grilling, whisk together the reserved ¼ cup marinade with Greek yogurt in a small mixing bowl. Serve as a dipping sauce alongside the finished skewers. Isabelle – you’re totally right. When everything is so fresh and in season I don’t cook nearly as much as I normally would either. It tastes so good as is, I just cook, assemble or flash something (not my tatas) together quickly with minimal effort because it doesn’t need any working. Your chicken looks great. I’ll def try out the spice rub mixture thingy next time I get some.